Compared with other common malignancies, the prognosis for lung cancer patients is poor, with more than 75% of patients presenting with largely incurable advanced stage lung cancer. A new strategy is needed, aimed at detecting lung cancer earlier, treating in a lung sparing manner and preventing early disease by understanding pre-cancerous lesion development. Understanding more about the key steps in early lung cancer pathogenesis will allow the development of novel therapies targeting early pre-invasive disease. This could possibly lead to chemo-prophylactic therapies in those most at risk. Our research targets include screening or surveillance of asymptomatic high risk patients and detecting and biologically interrogating pre-invasive lung cancer lesions to enable mechanism directed chemoprevention. We also aim to better understand the clonal origins and tumour evolution of early lung cancer to deliver effective lung sparing treatments for pre-invasive (and very early invasive) disease, and to develop quality assured management pathways for suspected disease that facilitate rapid diagnosis. Finally, identifying patients at highest risk of disease recurrence post-radical treatment and establishing a cross site quality assured tissue bank to support personalised and precision medicine will be vital. 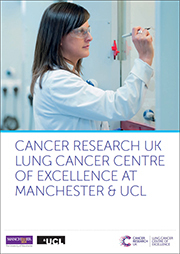 Manchester and UCL already share clinical expertise in early lung cancer detection and treatment; with shared protocols for patient follow up, treatment and research biobanking across both institutions. The new CRUK Lung Cancer Centre of Excellence at Manchester and UCL will expand the previously established University College London Hospitals NHS Foundation Trust (UCLH) Lung Surveillance study that has led to an unsurpassed collection of patients studied longitudinally, with lesion, blood and sputum samples collected from the same patients and lesions over time, enabling genetic mapping of lesion progression or regression. Together we lead the CRUK funded LUNG-SEARCH study investigating the use of sputum, auto fluorescence bronchoscopy and CT in the early detection of lung cancer in high risk populations. UCL was recently awarded funding to examine the feasibility of CT screening in a UK population of lower socioeconomic status. Manchester and UCL already collaborate on several rapid diagnosis and staging studies and are co-applicants on the PEARL trial – an early intervention study on pre-invasive disease. UCLH also leads the STREAMLINE whole body MRI diagnosis and staging trial. We have a critical mass of over 20 clinicians and scientists working on early lung cancer pathogenesis and investigating the role of stem cells in tumour initiation and treatment. We will develop the largest collection of samples from high risk individuals with pre-cancerous lesions enabling the clinical and biological delineation of the evolution of squamous cell cancer. In collaboration with the Sanger Institute in Cambridge, a large scale whole genome sequencing programme will be undertaken to examine the key genetic features that lead to progression of pre-cancerous lesions. Exome sequencing will be combined with methylation and gene expression arrays to distinguish the genetic and biological markers of lesion progression compared to those lesions that regress. Mechanistic investigation of key genes that predict progression will be examined with a view to determining biomarkers of progression/risk, candidates for circulating biomarkers of lung cancer risk/detection and the development of novel therapies targeting early lung cancer development. Honorary Senior Lecturer in the Division of Infection, Immunity and Respiratory Medicine at The University of Manchester and Consultant in Respiratory Medicine based at the University Hospital of South Manchester. Chair in Respiratory Medicine at UCL and Consultant at University College London Hospitals NHS Foundation Trust.